Soft tissue tumors are tumors that occur in mesenchymal tissue, including epidermal and dermal benign tumor, cystic lesion, and malignant tumor located in the deep fascia. Most of the soft tissue tumors are benign tumors; manifestations of benign and malignant tumors are similar. Whatever malignant tumors that happened in the soft tissue, in principle are called sarcoma. Currently, causes of soft tissue tumor have not been defined yet, but it is well-known that soft tissue tumor is related to the following factors: 1. Gene (genetic) theory: gene mutations of normal cells can cause cancer. Tumor cells constantly proliferate and inherit the biological characteristics, such as hereditary multiple exostosis. 2. Chronic stimulation theory: (1) chemical chronic stimulation, (2) physical factors. 3 Virus theory has found that blood serum of patients with osteosarcoma contain specific antibodies of osteosarcoma. 4. canceration. 1. Systemic manifestation: both benign tumor patients and early malignant tumor patients rarely have obvious systemic symptoms. Late malignant tumor patients, such as bone sarcoma, rhabdomyosarcoma or metastatic carcinoma, can have cachexia symtoms, such as anaemia, emaciation, loss of appetite, weight loss, fever, etc. 2. Local manifestation: pain of bones, joints, soft tissue, osseous or soft tissue mass, dysfunction, these are common local manifestations of malignant bone tumors. (1) Pain: pain is the most common symptom of tumors of rapid growth. At the beginning, the pain is light and intermittent, and gradually develops into a violent persistent pain. 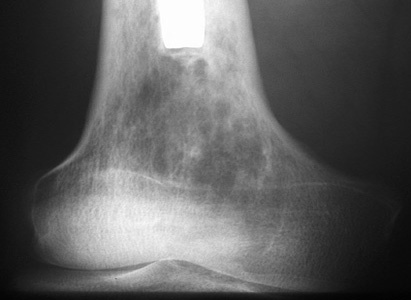 This is mainly due to tension or pressure imposed by bone tumor to sensitive periosteum or endosteum. But the pain does not necessarily explain the tumor is malignant, because some benign tumors, such as osteoid osteoma may cause pain due to reactive bone growth and pain. If pain suddenly and violently attacks, this may easily cause pathological fracture. (2) Mass: benign tumors often present hard and non-tender lumps. Malignant tumors of rapid growth often present as a diffuse swelling, tenderness, skin fever, superficial venous engorgement. (3) Dysfunction and compression: if tumor is close to joint, activities will be restricted; pain would increase when the joint moves. For tumors occurred in spinals, no matter benign or malignant, spinal cord compression would be caused and further lead to paralysis. (4) Malformations: patients in growth age or patients with pathological fractures, may suffer from malformation, for instance, multiple osteochondroma would affect growth, and even cause limb bending with unequal lengths. Enchondroma can make bonelets of hand and foot deformed. If tumor invades into epiphyseal plate, then it would cause maldevelopment. Experts of Modern Cancer Hospital Guangzhou remind: the above symptoms are common symptoms of soft tissue tumor, if similar circumstances occur, patients should go to standardized hospital a.s.a.p. for examination or treatment.